How to get to Katherine Gorge in Nitmiluk National Park Australia Darwin to Alice Springs Australia - About Katherine Gorge and Katherine Gorge cruises in Northern Territory Australia. Katherine Gorge - Nitmiluk National Park This 292,800 hectare National Park is owned by the Jawoyn Aboriginal people and jointly managed with the Parks and Wildlife Commission of the Northern Territory. 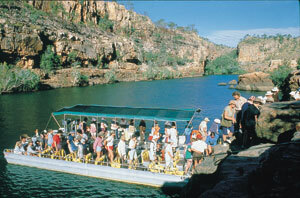 How to Get There Nitmiluk National Park is located in the Top End of Australia's Northern Territory. The Park has two main points of visitor access. 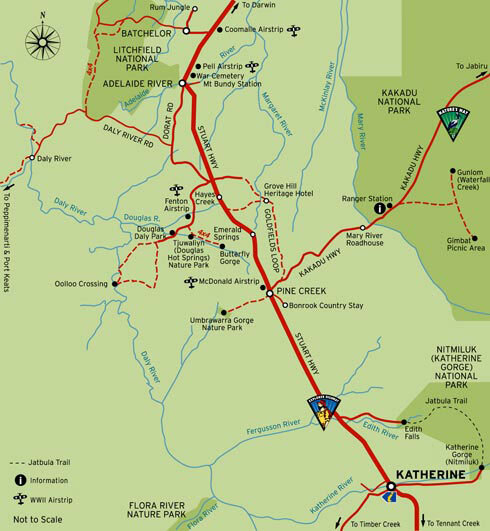 The Park's main entrance is located 30 km northeast of Katherine via a sealed road. 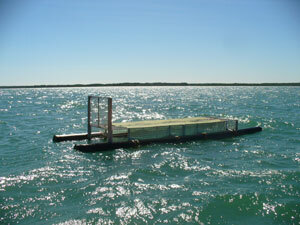 Katherine is located 310 km south of Darwin along the Stuart Highway. This road is called gorge road and also we knoew it as Maud Creek Road on occassions. Leliyn (Edith Falls) on the western side of the Park, is reached by turning off the Stuart Highway 42km north of Katherine then following a sealed road for a further 19km. When to Visit The most comfortable months to visit the Park are from May to September. The wet season causes flooding of the Katherine River and restrictions on some of the activities available. The access road may be cut off for short periods during peak flooding times. Leliyn camping has a landscaped campground with unpowered sites. Generators are not permitted. Camping fees apply and should be paid at the kiosk near the picnic area. When the kiosk is open, campers should pay fees before setting up camp. After hours visitors should find a site and pay fees at the kiosk the next day. The campground does become full during the peak tourist season (June to Sept), and sites are issued on a ‘first in first served’ basis. 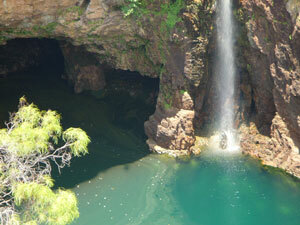 Picnic and camping facilities are provided at the Falls. Limited gas barbecues, tables and an ablution block with toilet and shower facilities are provided for your use. There is a kiosk where you can obtain your permit for camping at Sweetwater, purchase food and drinks and pay your camping fees. The picnic area provides gas barbecues, picnic furniture and toilet facilities. 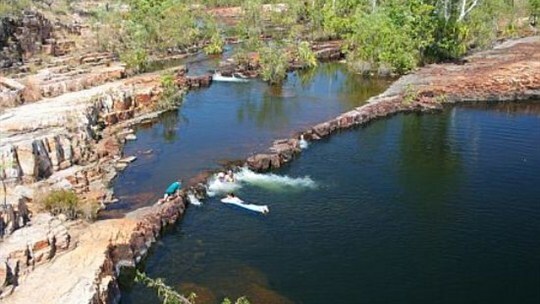 Sweetwater Pool is a secluded swimming hole on the Edith River. Overlooking Sweetwater Pool is the last campsite (with toilet) before you join the Leliyn loop walkers. 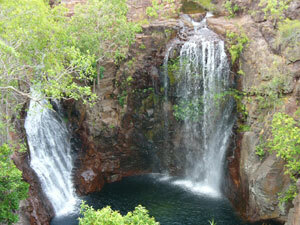 It is a great place for swimming and relaxing and is located along a 4-km walking trail from Leliyn/Edith Falls. 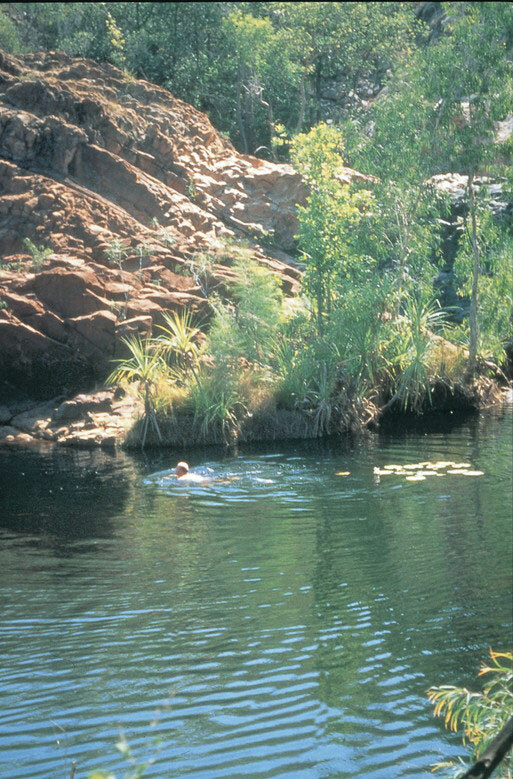 It is also the last swimming spot and usually a lunch location along the iconic Jatbula Trail, a 58-kilometre long bushwalking trail in Nitmiluk National Park (Katherine Gorge) that starts at Katherine Gorge and finishes at Leliyn / Edith Falls. Time your visit to Sweetwater Pool for early morning or late afternoon to catch the sight of stunning reflections across the still waters. Have a dip and then find a spot on a flat ledge to warm yourself. If you're lucky you may see several species of turtle if you decide to camp the night. Walking - There are two walks at Leliyn. • Leliyn Trail - a 2.6 km, 2 hour circuit that ascends a hill then goes down to cross the upper pool above the falls. It then climbs up the other side of the falls before descending to the level of the main pool where there is a river crossing. Views of the waterfalls and Edith River from two lookouts, on one each side of the river, feature in this walk. So does swimming in the upper pool. Wet season conditions can limit access, reducing the walk to a return trip to the first lookout and top pool. 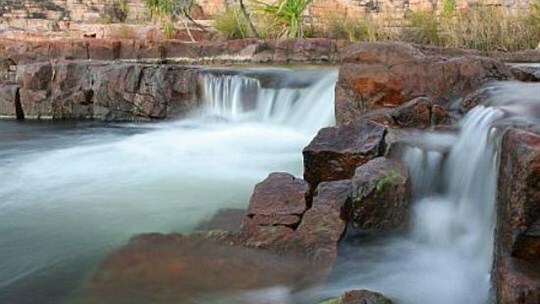 • Sweetwater Pool - an 8.6km return walk to a fantastic swimming spot. This can be done as a day or overnight walk. There are toilets at the Sweetwater Pool camping area. 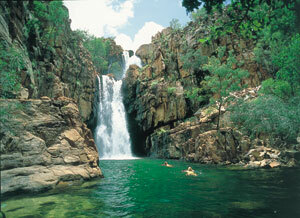 Overnight walkers must obtain a permit from the Edith Falls kiosk - bookings are recommended. A small fee and deposit applies to the bush campsites. Today you can enjoy the Trail as a five or six day walk. It is only marked in one direction, from Katherine Gorge to Leliyn (Edith Falls). The Trail is best done in the cooler months between June and August. 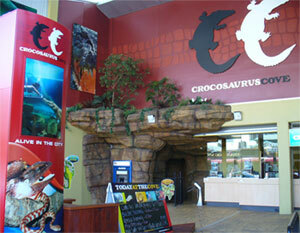 It is closed due to seasonal conditions from October to late May, however wet season rainfall can vary the opening date. The climate, terrain and length of the Jatbula Trail make it challenging. You really need to be fit and well prepared to safely enjoy the walk. If you wish to do a guided tour on the Jatbula trail then let us assist. Sorry we don't offer advice for self hiking please see Parks and Wildlife australia for assistence. There is no formed path and trail conditions vary from rocky with creek crossings, to flat sections with swampy bits. The Trail is marked by blue triangles, usually located every 20-50 metres. Intersections are marked by sign posts. 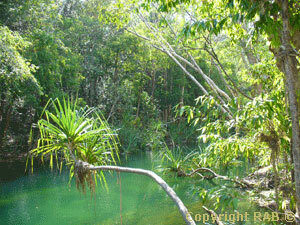 The Jatbula Trail lies within a region with distinct wet and dry seasons. Officially the dry season is from May to October and the wet season from November to April. However, October to December is a very hot and humid time known as ‘The Build-up’ where temperatures can exceed 45o C on the escarpment. Most people complete the walk between May and August when it is cooler, however daytime temperatures can reach 40o C.
All campsites along the Jatbula trail are near permanent water. The tumbling waters of Biddlecombe Cascades reward walkers with soothing pools to sit in and cool off. The nearby campground is nice and flat, toilets are provided. Crystal Creek above Crystal Falls is wide and deep. It’s a great place to swim and explore upstream. Toilets provided. Be aware the river crossing here can be challenging. 17 Mile Falls campground sits high above 17 Mile Creek. Toilets provided. Get to camp early so you have time to enjoy swimming and rockhopping up the creek. Edith River Crossing marks the start of your journey along the riverine corridor of the Edith River. A good spot for a rest and a swim. Sandy Camp Pool on the Edith River lives up to its name with the softest sandy campsite beside a nice big swimming hole. Take care when crossing the creek here, often very slippery. Toilet provided. Overlooking Sweetwater Pool is the last campsite and swimming hole before you join the Leliyn loop walkers. Toilet provided. The Crystal Falls area features a mass of rock pools, rapids and small cascades that fall away into a spectacular and large waterfall. The area can only be reached by trekking the iconic Jatbula Trail. 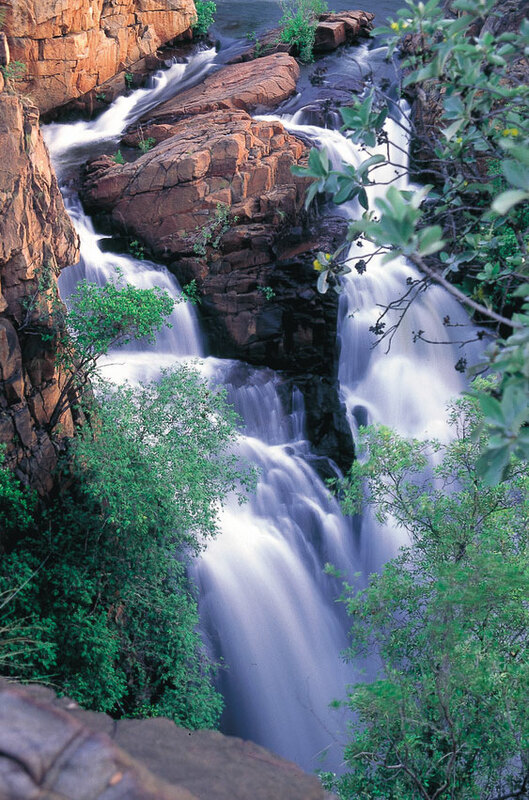 Located within Nitmiluk National Park (Katherine Gorge), this 58 kilometre trail takes between four to five days to complete and is a one way walk from Katherine Gorge (Nitmiluk) to Leliyn / Edith Falls. Eighteen and half kilometres along the Jatbula Trail, Crystal Falls is a very relaxing area with a large river that feeds the rock pools, cascades and waterfall. The camp site is on rocky ground above the 30 metre high falls. There is a barbecue and a nearby lookout over the waterfall that is a lovely place to watch the sunset. Located on the southern side of the Crystal Falls is an Emergency Call Device (ECD). 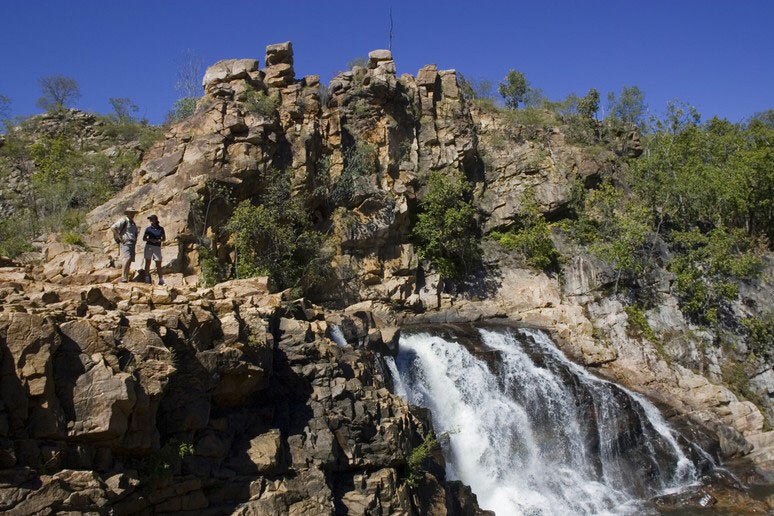 Walkers must register at the Nitmiluk Visitor Centre and report your arrival to the kiosk at Leliyn / Edith Falls. A refundable AUD50.00 deposit is required when you register and will be returned when you arrive at Leliyn / Edith Falls. 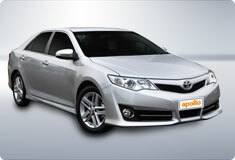 A camping fee of app. AUD3.30+ per person per night will be collected when you register. © 2013 All rights reserved | Australia 4 Wheel Drive Rentals and Australia 4 Tours Group - Australia, Reichardt Road, Winnellie 0820 Darwin, Northern Territory Australia | Tel: International +61 8 7999 7511 Within Australia Free call 1800 107 371 | Email: info@australia4wdrentals.com | ABN 54 561 356 425 | With very special thanks to NTTC.